Andy's new series, THE INVENTORY: IRON FIST and THE INVENTORY: GRAVITY, are out now! 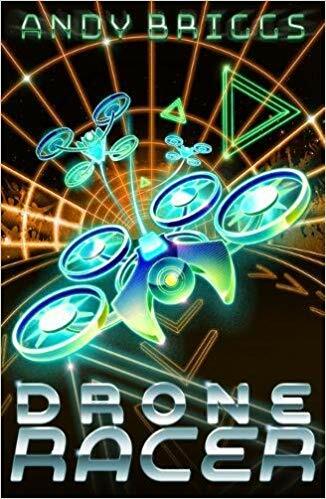 DRONE RACER is his new MG action adventure book, out September 2018! In 2016, SPYQUEST: POLYBIUS was released. This is a unique book that ties in with a computer game availible in hotels around the world. It uses Augmented Reality to enhance the story experience. Andy's first non-fiction book was published by Loney Planet in 2015: HOW TO BE AN INTERNATIONAL SPY. Andy has have a wild, interactive, and very loud, INVENTORY presentation which shows the children how he became a writer (with some great photos from the film work I do in Hollywood), and how they can do it too (encouraging them to write with the attitude of: "If I can do it, you can"). Then he tells them about the books themselves, followed by a loud interactive quiz in which they all take part - we warn you, the children usually get very enthusiastic and rowdy!). Lastly, a Q&A and, hopefully, a signing (with a local bookseller of your choice!). This works brilliantly with large groups (such as year groups) and lasts for an hour. If you offer him coffee and biscuits, he can do several shows per day. "He came into English to give year 8 students an exciting, funny, interactive talk, which everyone clearly enjoyed. I believe it was the most entertaining and interesting talk we have had in English. He convinced us that there is much more to a writer than meets the eye... He also interested us with the excitement and adventure behind it all; riding through jungles on the back of an elephant, smelling gorillas! I think everyone was inspired and will look at writing from a completely new angle." "Children were awestruck by the whole experience and will have lots to share with the rest of the school when we do our Book Awards assembly." "…the children were very excited in the minibus going back to school. They all said they've great ideas about writing stories. So I have given them a challenge to write their stories over half term, they all agreed!!" "I just wanted to thank you again for such a fantastic presentation this morning – one of the best author visits we have had! Our students and staff thoroughly enjoyed themselves – you were brilliant." "Inspiring, motivating, exciting, challenging could go on and on...................................... The feedback from students and staff has been amazing you have had such a positive impact here at Lathom!" An action-packed novel that brings drone racing to life! Carson and his friends love racing drones, and they can't believe their luck when they stumble across a discarded one at a junkyard. But this new find is full of surprises. When they power the drone up, it starts talking! And it's fast. Really fast. They could win big prizes in the racing leagues. Trouble is, someone wants their incredible drone back, and they'll stop at nothing to get it. How can three kids protect their new friend? Much of the Inventory's technology has fallen into the wrong hands - including Newton's Arrow, a powerful weapon that can manipulate gravity. It's up to Dev and his friends to get it back, and they follow the weapon's trail around the world. Along the way they learn disturbing details about Dev's origins. Surfing the net during a lightning storm has amazing consequences for a group of teenage friends. Superhero powers are theirs at the click of a mouse! Trouble is, they don't know what the powers will be until they try them out . . . The World Consortium is recruiting more agents to defend the most advanced technology the world isn't ready for, and it's up to Dev, Lottie and Mase to train them up for action. But will they be ready before Shadow Helix's next strike? And has Dev uncovered all the secrets of his past, or is there more to know about his special abilities? Dev is called back into action to defend the world's greatest store of futuristic tech, and he'll need all the help he can get from his friends. Someone has stolen Winter Storm, a swarm of powerful biobots, and is using them to infect and control people! Who can be trusted now? The Hero Foundation is a shadow of its former self and Lord Eon - the most terrible supervillain ever - is still at large. Worse, he has hatched a plan to tear apart time. Toby and his superhero friends should be able to stop him . . .
New heroes, old friends, all adventure! Jake Hunter's adventures continue in his 4th book! A series of ritualistic murders in the small town of Black Root all have one thing in common: theyre reminiscent of ancient witch trials. The FBI are on the case and soon realize that a supernatural killer is on the prowl - condemning his victims to diabolical ordeals. In 1933, American showman Carl Denham returned from a mysterious, hidden island with a priceless treasure. A treasure not gold or jewels, but the island's barbaric god, a monstrous anthropoid called "Kong." Entombed for millennia, a team of combat dinosaurs is accidentally reanimated by 14-year-old Carl Heyward. While trying to keep them a secret, Carl discovers the evil Saurons have survived too.